Well hello everyone. Yes I’ve been quite busy of late so a blog update is well overdue. Ive been working on a couple big projects, one being an exhibition! This is a first for me, so I’m a little nervous. Hopefully the big wide world likes what I’ve done. I’m sharing the space with William Bardebes on a common theme; “Shifting Perspectives”. The idea is to explore and expand the boundaries of both physical and virtual spaces, making the unreal real and the real unreal. I’m hoping the time is right for this as the attitude towards digital art is finally improving. I used to always get the response “a computer did that?” but as technology has infiltrated society the general populous are starting to realise that there is in fact a bit of skill involved. I suppose I’ll find out if it’s considered art or not soon, in fact It’ll be next week. 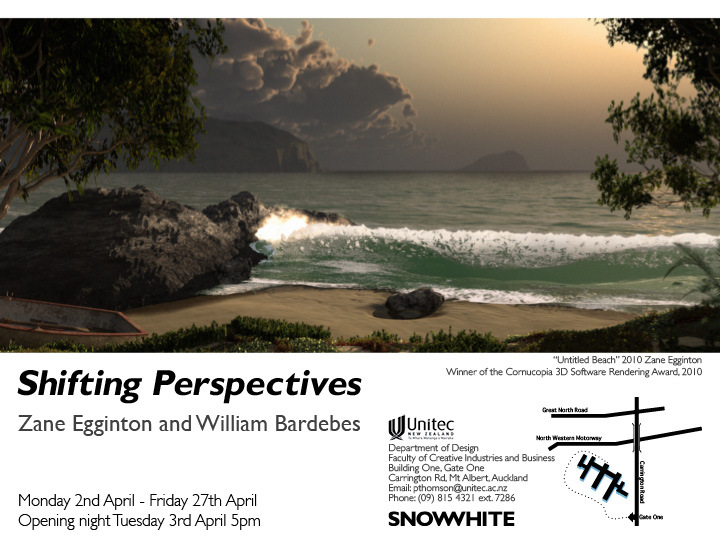 It opens @ 5pm, Tuesday 3rd April and runs until 27th April at Unitec’s Snow White Gallery. Consider yourself invited. art, digital art, exhibition, gallery, Snow White, unitec. Bookmark.